Video game heroes win extra life all the time, but what about video gaming web sites? We recently worked with Epic Games, a pioneer in cutting-edge gaming technology, to give a "1-up" to the marketing site for the "Unreal Technology" cross-platform game engine. 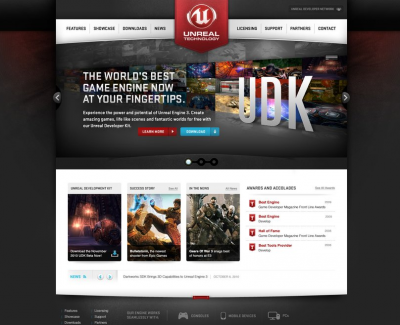 The original site was 10 years old and didn't accurately showcase Unreal Engine's industry-leading technology -- a technology that was featured on stage by Steve Jobs during the iPhone 4 launch. To tell Unreal Engine's compelling story, we started with an initial engagement to create mood boards and set the visual design direction. We had fun with three game-inspired boards, including this one, which was ultimately chosen to inform the site's design. Next, we took the site through our full redesign process -- starting with user experience research and strategy, moving through visual design compositions based on the selected mood board, and culminating in front-end build-out of the page designs. 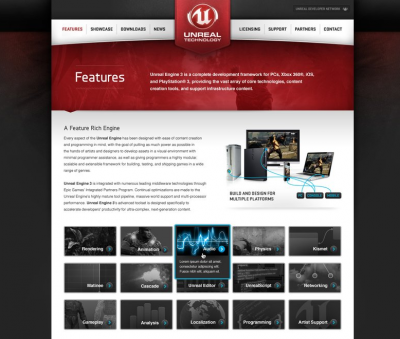 Through our UX and marketing work, we revised the site's architecture and page layouts to better emphasize Unreal's capabilities and success stories, while also encouraging users to get in touch with the Epic sales team. 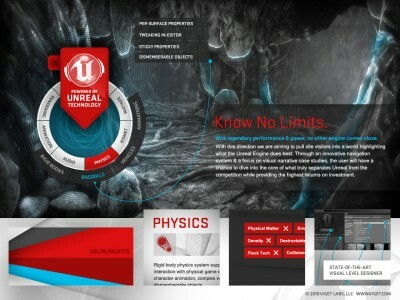 We then brought these layouts to life with sleek, functional visual designs that mirror the experience of a high-tech video game and emphasize Unreal's vivid imagery. Once we built out the design templates, we handed them off to the client for back-end integration and content integration. Throughout the project, we had the pleasure of working closely with both the Epic Games team and the stellar back-end development team at nGen Works. We loved having the chance to visit the Epic offices, just down the interstate from Durham ... And we're especially grateful for the opportunity to fly down their giant, two-story, indoor slide! The site is already enjoying early success. In the first month after the February launch, UnrealEngine.com has seen a 179% increase in page views. Visitor engagement is up, as shown by significant increases in average time on site and average number of pages per visit -- plus a 25% drop in visitor bounce rate. The Epic Games team was also quite happy with the results of this project. Community Coordinator Stacey Conley said that "the response has been overwhelmingly good, both internally and externally." Senior Web Developer Ian Thomas adds, "it looks amazing and behaves wonderfully. I know everyone put a lot of work into this and I just wanted to send a congratulations on a job well done to you and your teams." Viget definitely had a great time working on this site, and we hope Unreal Technology continues to be a hit in the gaming community!